A key mission clearly stipulated in Iran's constitution, is to export its Islamist ideology, and actively ensure the continuous infiltration and expansion of Islamist values throughout the world. That is why the Revolutionary Guards established a special force, the Quds Force and Basij, with a publicly-announced mission of becoming engaged in extraterritorial operations -- religiously, ideologically, militarily and politically. These Islamist spies normally come to the West, and particularly the US, under various guises, including seeking education, engaging in research, or for health-related purposes. They target specific US embassies, universities, research centers, or hospitals to obtain visas. Their ability to present themselves as ideal candidates for help creates the appearance of safety; meanwhile, their intentions may be to cause widespread harm. When Dehnavi was blocked at the Boston airport, many pro-Iranian regime agents in the US resorted to various methods, including using mainstream liberal media outlets, in an attempt to ensure his entrance into America. They devised a fake narrative of injustice and depicted this high-ranking Basiji military agent as an innocent man who should be allowed into the US. How was this man even able to obtain a US visa? The continuing persecution, imprisonment, murder and torture of non-Muslims is now well-documented and visible on a daily basis. In particular, Christians, Jews, Yazidis, Kurds, Hindus and Baha'is are victimized under Islamist rule. This issue requires attention and correction, but it is not the only threat that is coming from these tyrannical state and non-state actors. Islamist organizations are dispatching their agents beyond their borders, to the West, particularly the US, in order to monitor, threaten, and terrorize non-Muslims. Recent reports from European refugee camps indicate that radical agents and spies, including from one of the most powerful Islamist establishments, Iran's Islamic Revolutionary Guard Corps (IRGC), have infiltrated Europe, in part to monitor Christians, particularly those who have fled their nations out of fear of torture, imprisonment and persecution. IRGC leaders and its intelligence services have frequently boasted about having agents and spies in Washington, DC and other Western capitals. The IRGC's major affiliates are the elite branch of the Quds Force and Basij, an ideological militia group. One of the core missions of the IRGC, like other Islamist establishments, and as stipulated in Iran's constitution, is to safeguard Islamic as well as revolutionary values (including anti-Semitic and anti-American principles) in their homeland. The other key mission which is also clearly stipulated in its constitution, is to export Iran's Islamist ideology, and actively ensure the continuous infiltration and expansion of Islamists values throughout the world. That is why the IRGC established a special force, the Quds Force and Basij, with a publicly-announced mission of becoming engaged in extraterritorial operations -- religiously, ideologically, militarily and politically. It is critical to point out that the Islamist mission of radical Muslim organizations anywhere in the world is not limited to their city, country, or region. This is because they do not recognize "man-made" nation-state systems; they do not recognize boundaries and governments. They believe that the whole world, since its inception, is in reality the divine possession of Islam. They believe that states, particularly Western governments, have taken their Allah-given lands, eternally belonging to Islam; and that non-believers have wronged their God, Allah, by misrepresenting Moses, Abraham and Jesus to create false religions such as Judaism and Christianity. They believe it is their sacred mission to recapture, by any means, everything -- the universe – which they believe has been taken from them. "By any means" can include suicide attacks that slaughter hundreds, even thousands, of people, including Muslims; endless incitement to violence among strangers and neighbors, and all available ways of manipulating soft power. These Islamist spies usually come to the West, and particularly the US, under various guises; these include seeking education, engaging in research, or for health-related purposes. They target specific US embassies, universities, research centers, or hospitals to obtain visas. Many people point out that these individuals also seek the assistance and sponsorship of the Iranian regime's assets in the US to facilitate their process. Their ability to present themselves as ideal candidates for help creates the appearance of safety; meanwhile, their intentions may be to cause widespread harm. Mohsen Dehnavi, for instance, was recently deported by US border officials. Dehnavi happened to be an Iranian military agent; an active and high-ranking member of the Basij; previously, head of the student branch of the Basij at Iran's Sharif University; a loyalist to Ayatollah Khamenei, the Supreme Leader of the Iranian regime, and had personally received gifts from Khamenei. 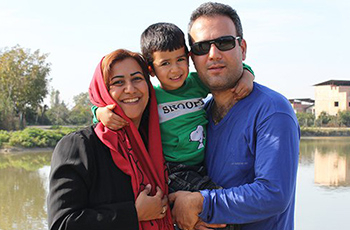 US border officials recently deported Mohsen Dehnavi, an Iranian military agent who is an active and high-ranking member of the Basij paramilitary. 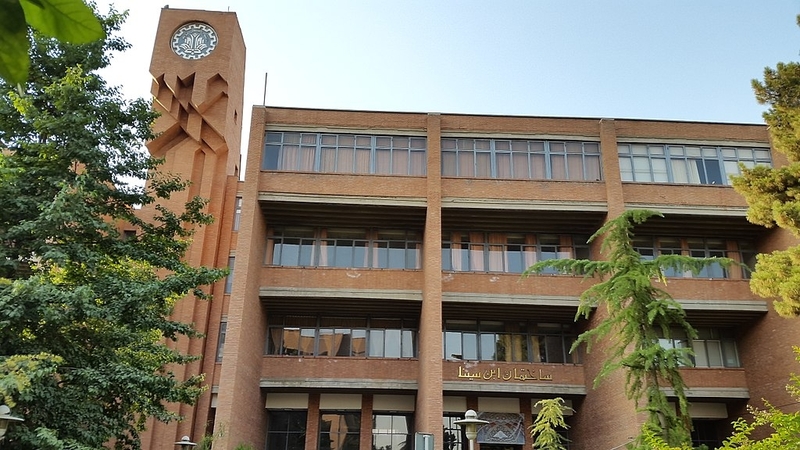 He was previously head of the student branch of the Basij at Iran's Sharif University (pictured above, photo by Behrooz Rezvani/Wikimedia Commons). The life-long slogan of members of Basij is, "Death to America" and "Death to Israel". A dedicated member of the Basij will closely monitor non-Muslims and do absolutely anything to please the Islamist Supreme Leader. There is no act of violence too great for the Basij. Those who commit murder are considered heroes of their faith. The Basij and the IRGC's goal is violence, and the destruction of anyone with a belief different from their own. How was this man even able to obtain a US visa? In a surprising and rare move, US border officials did not automatically accept this Iranian's US visa as a green light to enter the US. If it were not for their questioning and taking a second a look at his background, he would be operating freely in the US -- with consequences that could have been tragic. The question is: How many people like him already are already operating freely in the US, as IRGC officials repeatedly claim? An extremist Muslim Basiji such as Dehnavi has been charged with the mission of safeguarding Islamist values, suppressing dissidents, and closely monitoring non-Muslims, primarily Christians. When Dehnavi was blocked at the Boston airport, many pro-Iranian regime agents in the US resorted to various methods, including turning to mainstream liberal media outlets, in an attempt to ensure his entrance into America. They devised a fake narrative of injustice and depicted this high-ranking Basiji military agent as an innocent man who should be allowed into the US. Their goal was to manipulate the hearts of Americans, who would be willing to fight for this man's cause and welcome him with open arms to the country that his organization has vowed to destroy. Through steady, gradual infiltration, Islamist organizations create Islamist militias and proxies. The entrance to the US of Islamist agents, spies, and sympathizers with extremist institutions, such as Iran's regime or the Muslim Brotherhood, should not be taken lightly; it should be monitored closely on different levels by US officials, consulates and embassies. Having an impressive resumé, having a scholarship or fellowship from an American institution, or even claiming to have defected from an Islamist organization does not mean that it is safe to hand someone a visa and allow him into the country. In addition, as above, even having a visa should not mean that border officials cease investigating -- closely and meticulously -- a person's background for a second time. Otherwise this trend is sure to grow -- exponentially. Dr. Majid Rafizadeh is president of the International American Council on the Middle East. He is a Harvard-educated Iranian-American political scientist, business advisor, and author of "Peaceful Reformation in Iran's Islam". He can be reached at Dr.Rafizadeh@Post.Harvard.Edu. The whole USA should stand behind the President Trump. His intentions are noble and he is the only one there who sees the problem for what it is! Islam is spreading and the agenda of Islam is submission of the whole world - or death! Anyone denying this truth is a traitor! Read! people, read that damn book called Koran, and learn what is waiting to happen to us. We are too comfortable to care - and that is our problem! Once the Muslims become the majority in any country, nobody has a chance- become a Muslim or die! There will be a lot of dead people! We have worked so hard to build our Christian countries full of culture, joy and comfort - and they are after this! Free of labor to enjoy once we are all dead. This is the ugly truth! Islamist infiltration is a serious problem. However the situation for some countries in the Middle East: Israel, Palestine, Gaza, Iraq, Syria and Lebanon, is different from the rest of the world. In the above mentioned countries is Iran's politics a major problem. However not so much in Europe. We witnessed all kinds of terrorist attacks, but all of these were out of Sunni's origin and none from Shiite. Furthermore there is not any indication that Europeans will convert to Shiitism. So for Europe Iran poses no problem. That is not to say that we should not be in solidarity with Israel, however the situation in Europe is different. Islamist infiltration in Europe will mainly happen through the Muslim brotherhood I suspect. What is it you don't understand in : "they do not recognize "man-made" nation-state systems; they do not recognize boundaries and governments. They believe that the whole world, since its inception, is in reality the divine possession of Islam"
Paul, Iran funds Muslim groups in other countries. In a declassified CIA document in 1983 comparing Khamenei's ideas with Rafsanjani's, Khamenei preferred the non-violent approach, what he calls a "soft war." Make no mistake that Iran has sent people here who are not like those who escaped the regime back in the 1980s. There are Iranian imams here preaching anti-gay sentiments, I saw in Virginia Iranians memorializing Ayatollah Khomeini's memorial day--something that never happened in my lifetime as Americans hated the man. An imam on camera talking about it like it's something normal, he who took our hostages. There are many upset Iranians who truly hate the regime, and my friend in Iran hates them too and thinks the Left is as crazy as their's was in the 1970s. They have also funded some mosques. Forget that Iranians need the money, jihad is more important. That's not to mention the spies for military purposes. Saudi Arabia and Iran don't much like each other, and KSA doesn't like Khomeinism, but they both believe in jihad aka spreading Islam which is Muhammad's command, and they don't care if they ruin countries and turn them into the morass like their own-Jamaal-e-Islami put this clearly. Turkey is another big player funding many mosques and organizations, and Erdogan is a fan of the Muslim Brotherhood. They are all a threat to our way of life...pretty much every Muslim organization because many are offshoots of the Muslim Brotherhood. I'm am very glad we live in a country that has, as a defense for its citizens, the Second Amendment and its rights. I'm a combat veteran who is armed. There are millions of me in the US, with veteran estimates at around 23 million and over 50 million armed civilians as well. Many of the above Americans will not take kindly to being accosted in any manner by some Iranians. When it comes to human rights abuses, denial of free speech and religious freedom, Iran is the LEAST offender from such countires as Azerbaijan, Turkey, Saudi Arabia, Pakistan, Somali, Sudan, and at least another score of Moslem countires. Why does the West and the Western press have such a willful blindspot when it comes to the most egregious and barbarous practices of these other countries, compared to which Iran has a more inclusive and tolerant attitude. Remove your blinders and look at the horrendous and genocidal policies of those other countries, and acknowledge that Iran treats its religious minorities, including Christians, far far better than Turkey, Azerbaijan, Pakistan, Saudi Arabia, Somali, Sudan etc. Yes, indeed Edward Sarafian. However, the issue is about the Iranian threat, which is very well explained here. Human rights is a Western concept born from Jesus Christ our Lord. Islam is the complete opposite. It is not a question of "least" or of the more "barbarous" practices in other Moslem countries. The point is that Islam denies human rights to all. A few Muslim Brotherhood members were appointed to Obama's White House advisory committees and groups, and were fairly visible. But, the White House and Federal agencies are undoubtedly littered with less visible Muslim Brotherhood members, implanted by Obama, Brennan, and Hillary Clinton. Some of them reportedly were issued security clearances. McMaster has no problem with Susan Rice, doesn't consider unmasking to be wrong, and won't say "Islamic terrorism". He is purging those who have problems with Susan Rice, who consider unmasking to be wrong, and who will say "Islamic terrorism". So, it is unlikely that McMaster is cleansing the Trump Administration of Muslim Brotherhood members. If he doesn't, who can, and will? This evidence of what Iran and other Muslim occupied countries are doing, should be enough to try B. Hussein Obama, John Kerry and their Muslim Brotherhood supporters for treason as it is specified in US Constitution...as they had cavorted with the enemy of US, genocidal Iranian ayatollahs in their nuke "deal". Lock them all up, together with stupid American Jews who are accomplices in this destruction of Western civilization, starting with destruction of Israel whom several nukes could "wipe from the map of the world" as ayatollahs threaten all the time. Guantanamo will not not be large enough to house all these traitors of US Republic and their DEEP state accomplices in various US government agencies who are shielding Nazi-like IDEOLOGY of Islam, which teaches hate of ALL non-Muslims. Thanks to Gatestone for this great article. My highest consideration for the author Dr. Majid Rafizadeh. Guys like him should be given a platform in each and every MSM to wake up and educate the sleeping and slumbering masses particularly the self-proclaimed experts (nuts) on ISLAM and ISLAMISM. I fear however he will be a lone voice in the wilderness. The price the Western civilization will pay for its complacency and naivety will be horrific. "Horrific," indeed, Walter but "complacency and naivety" are not the worst of what ails Western Civilization in the U.S. There was a time (60s, 70s, 80s, even 90s) when "liberals," even if "bleeding-heart"-type tended to be well-informed Democrats, at least some of which were also educated; whereas today's so-called "liberal" skips whichever way the masses lead her, ignorant of history and international affairs on every level, even as those might pertain to HER OWN TOPIC of liberalism. This ignorance is so vast that it amounts to idiocy, as she argues against known/accepted "facts," thinking she needs merely to sway opinion(s) by simply hurling at her opponent (you) a few cliched terms like "racist" & "Islamophobic," in order to shut you down, while also claiming that, because SHE herself has no knowledge of, say, the immigrant crises in Europe/Scandinavia/Australia/Canada, YOU ARE WRONG and these crises do NOT EXIST (& never have), and that the ONLY reason you've mentioned them is because you're an Islamophobic racist who obviously believes everything you have heard at your office or at the mall. Sadly, it is this type of new-newfangled "liberal" (and I use the term very loosely) that was drawn by the Islam-funded "Women's March," headed by Palestinian-American Sharia-Law advocate, Linda Sarsour, drawing over half million pink-hatted anti-Trump protesters, duly "decorated" with like-minded, cliche-hurling stars/celebrities. And, unfortunately, it isn't as though we can even blame it on "age" and say it's "Millennial Liberals"... because, IF there is such an animal, I think it is too frightened by Islam and too fearful of seeming "politically INcorrect" to go to protest marches, unlike its counterpart(s) of yesteryear. I agree with you Walter. Another well-written article by Dr. Majid Rafizadeh. It raises awareness about issues that other media outlets like CNN and NYT willfully ignore to report on. It gives us unique perspective. He is brave, and to stands alone against the critics. Thanks to Gatestone too. The ignorance of politicians as to the intent of Islam and its followers is incredible. Anybody criticising Muslims and their theocratic ideology who is accused of racism should reply Muslims are not a race but multi ethnic adherents of a word dominating death cult. This answer in most cases shuts up critics because Muslims are indeed not a race. Muslims have been trying to increase their numbers and territory by murder and subterfuge for 1600 years history from various sources proves this and it has not stopped. The Augean Stables of the American Political, Legal and Military administrations should be cleared of all islamist OBUMMER appointees and any sympathisers since they are a dangerous fifth column working against putting the country right and protecting it from Islamic takeover. For what it's worth, Linda Sarsour's last name Sarsour means cockroach in Arabic. For those who know the Truth this is not a surprise. By any means possible, Islam will not cease until they have conquered the rest of us kafirs and people of the Cross. Even so, it is very disturbing to know that the Trojan Horse Obama facilitated these evil infiltrators into all areas of American life, with the support of the God-less leftist sympathizers. Trudeau is now continuing that ugly legacy in Canada with the support of God-less Canadians, having taken the cue from Obama. The infiltration is already too deep to undo, because the majority of leftists are doing their utmost to destroy Trump, the only person who is attempting to clean the subversive swamp. We are living with the consequences of a society that has rejected God.